Happy Holidays, friends! I’m eager to get the most out of these next two months, and I’m sure you are too. I’m still young enough to still enjoy just about everything including cooking giant meals, and even the cleaning up after. Stockings will be hung by the end of the weekend and I’ll start some of my freezable sides for Thanksgiving next week. 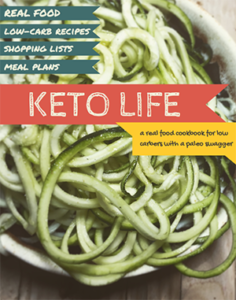 All that joy aside, I’m posting today to tell you about my Keto All the Way cookbook! 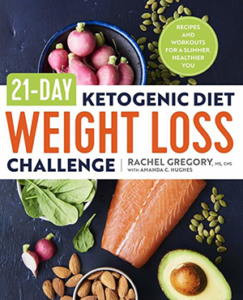 This is the cookbook I made for myself, and for my family who is following the ketogenic diet during the holidays. I made ALL of these recipes last year during the holidays and documented the most perfect version of each recipe. It was so important to me that if I was going to make a holiday cookbook, that you wouldn’t be nervous to serve anything new! Trust me, every single one of these recipes was a hit, even with the non-keto folks! My favorite recipe in the Keto All The Way Cookbook is one I made to taste just like those non-keto marshmallow-topped sweet potatoes. I think you’ll love it. Oh, and stuffing! There’s a recipe for stuffing that actually tastes like the real thing and can stuff a turkey! 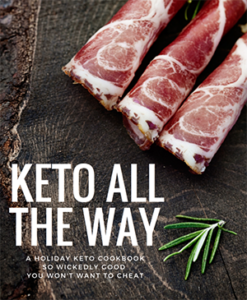 You’ll find that you can host an entire ketogenic meal with these recipes and I’ve included 5-holiday meal menus. Or, you can dabble in the “finger foods and shareables” section for a potluck or office party. All of these dishes are meant to be muggle-friendly, meaning even your non-ketogenic friends and family will love them, and you won’t spend two painful holiday months explaining your eating habits to people. I can’t wait to hear what you think about this new book, it’s my favorite project yet! 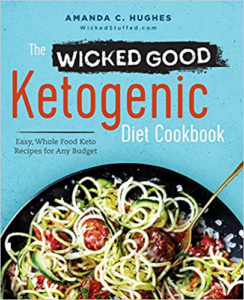 The Big 15 Ketogenic Diet Cookbook Review, a Recipe, and a Giveaway! Congratulations to you – very exciting. Recipes that appeal to non-ketoers and ketoers alike are a definite win. Many people will be cooking for both, especially during the holidays.